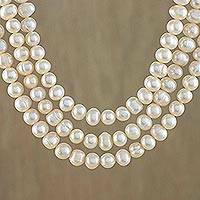 Three tones of pearls lend their classic elegance to this strand necklace. Thailand's Duanpen Tajunin selects white, cream and light grey pearls, knotting each one by hand. Delightfully feminine, this strand necklace is designed by Narayani of India. 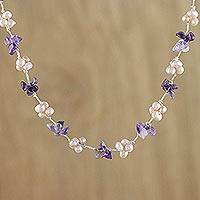 Pink aventurine and cultured freshwater pearls form two strands, with sterling silver accents separating the gemstones. 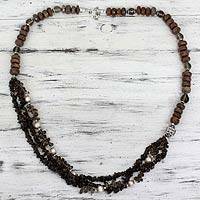 This original necklace from Bali accessorizes with dynamic sophistication. Designed by Buana, the sterling silver necklace hosts pearl moons and shooting stars.